I am still working through my online Bible study Autisms Hidden Blessings. If you are the parent of a special needs child or know someone who is, I have to say this resource is a complete must. It is authentic and real and genuine. It has ministered to my heart in a way that has rejuvenated and boosted my faith. I started and finished the chapter for this weeks study moments ago. It was on joy. It was healing for my soul. I feel like I put myself out there on this blog. I am vulnerable and authentic myself. Sometimes I am happy and others I am sad. Truthfully a piece of me will cringe a little bit when I post about the hard times or the struggles. It's a risk. Not everyone gets it or walks gently or encourages or lifts you up. Then there are those who can really medicate your soul with the love of Christ. That is a gift. Today I am going to take that risk again by being vulnerable. For some who look at our family and see the challenges that adoption has brought to us. They see the frustration and sadness from time to time and they may wonder how can this be worth it? Ill be honest, sometimes I am very sad. I'm sad when I see neurotypical children and what they can do compared to my girls. Sometimes the ground is so strange compared to any other territory I have ever been at before and I am at a complete loss what to do. I'm not always happy. Something in todays chapter though really brought me some freedom. "Joy and happiness are not one and the same. Happiness is a feeling entirely dependent on one's situation in life. It's fleeting and subject to the world around us. (Special needs) can crush the feeling of happiness. 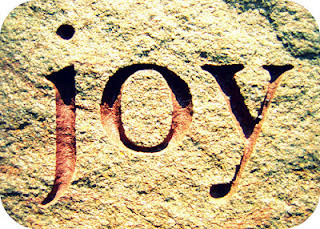 Joy however is something entirely different...joy is a state of delight and well being that results from knowing and serving God... Joy enables us to soar above (special needs) and live the life God intended for us...You need to know that we can't manufacture joy ourselves. Joy scripture says is a gift, a supernatural blessing from God, referred to as a fruit of the spirit." I can in all honesty say that raising kids is a challenge and raising special needs kids takes it to a whole new level. I'm not always happy but you know what I am joyful. My boys are really wonderful sons. My daughters are just as wonderful. Their skin colors, as it turns out, are not their only differences. I know 100% without a single doubt in my heart that all eight of us are blessed by God as he has brought us together as a family. Yes our family is bigger but more importantly our faith is bigger and I can confidently say so is our joy! We have served God in obedience as we have walked this path. We have each and every one of us come to know God and his heart more. Even my sweet chocolattes. Yes even they as I listened to their mumbled speech this morning on the way to preschool say they wanted to pray. I speak their language better than most, but I didn't recognize everything they said as they prayed. The cool part was I know God did and it was beautiful to his ears. And yesterday my Jubilee sang "this little light of mine" all the way to school. I believe that she is a light and God's glory will shine through her sweet little life. So I guess I will conclude with this. The next time I write a post and I lay myself bare with what is hard and frustrating and may even have me in an emotional pit, know this, I still have enormous joy. I still have Christ. Sure the enemy may come and try to steal my joy and sometimes in my weak flesh I succumb. But my God who is faithful always guides me back into the light. Into His truth, and as his spirit rises up in me, the fruit is produced. True joy. Praise his holy name! Love your comments and your post. You can tell in your words how much you love your children. Yes, raising kids like ours really can be a great source of joy! Sounds like you have it!